Detailed on Melissa Kit Chow’s personal site, the graduate of the Harvard Graduate School of Design helped create a new form of clothing that directly connects to Facebook. Created at the MIT Media Lab with Andy Payne and Phil Seaton, the jet black vest ties into the social media account of the user. 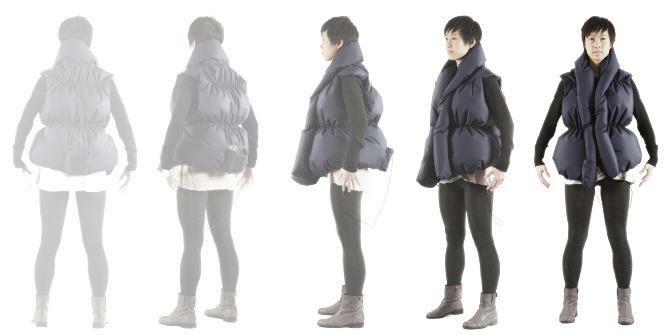 When a user’s account received a Facebook like on a status update, photo or video, the vest inflates to hug the user as a form of artificial contact. Assuming that the person that clicked Like on Facebook is also wearing a Like-A-Hug vest, the user can send the virtual hug back to the opposite party by squeezing the vest to deflate the air. Conceptually, this allows Like-A-Hug vest users to trade hugs and could be ideal for families separated by long distances. This isn’t the first product to offer artificial contact through a digital medium. During April 2012, roboticist Hiroshi Ishiguro was showing off a body pillow that’s designed to add a physical sensation to phone calls. Called the Hugvie, the user slips their smartphone into a pocket on the body pillow and vibrators inside the Hugvie simulate a heartbeat based on the tone and volume of the person on the other phone. Ideal for children, a parent that’s traveling for work could call up their child and use the Hugvie to simulate artificial contact during the call. It’s also being marketed to the elderly. This also isn’t the first time that the Facebook Like has been implemented into clothing. During May 2012, Brazilian fashion retailer C&A added a digital Facebook Like counter to wooden hangers within their stores. On the company’s official Facebook brand page, pictures of the various clothing items were posted. The amount of Likes on each picture directly changes the number on the hanger, thus customers can get a better idea of what’s popular with C&A fans.